LEA, Kasa Gallery (Sabanci University) and the Samek Art Gallery (Bucknell University) at the Zero1 Biennial. Where – California Theatre Courtyard, 345 South First Street, San Jose, CA 95113. When – September 14th at 6:30pm. 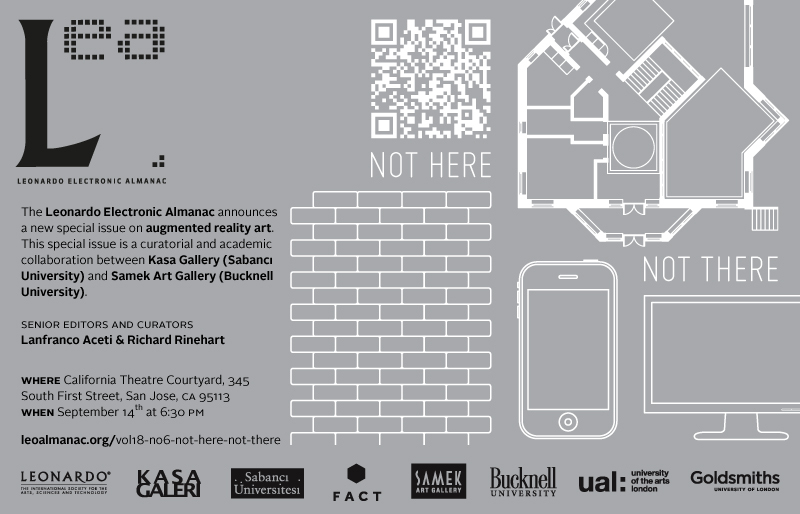 Lanfranco Aceti and Richard Rinehart will announce a special issue on augmented reality art of the Leonardo Electronic Almanac titled Not Here Not There at the ZERO1 Biennial in San Jose. This special issue is a curatorial and academic collaboration between Kasa Gallery (Sabanci University) and the Samek Art Gallery (Bucknell University). The issue follows two exhibitions of augmented reality art, one at Samek Art Gallery titled Not Here and the other at Kasa Gallery titled Not There. In this special issue of LEA there are contributions by artists that work with AR technology and curators and writers that work on issues related to AR, sited art in relation to new media, or site-specific interventions. It is a survey of the field in order to understand how contemporary art practices are evolving. It is also an opportunity to mingle and chat with the curators and discover what’s cooking at the Leonardo Electronic Almanac, the Samek Art Gallery and Kasa Gallery.